Electrical reliability test to a critical motor after failure was reported showing motor to be in good conditions. With hurricanes, typhoons and floods, there is no doubt many electric motors, transformers and generators have become damaged, contaminated and faulty from the elements. Testing motors to detect any of these issues is crucial in preventing destruction of the motor or winding system. All-Test Pro can help ensure safety in these situations. By using a de-energized Motor Circuit Analyzer, customers can find out the condition of their electric motors. It only takes 3 to 4 minutes to perform the testing per motor. The testing is performed at the MCC, with the hand-held, lightweight tester so there is no need to unwrap the leads at the motor unless you find a problem. It is easy, fast, safe and gives you immediate feedback on the screen. 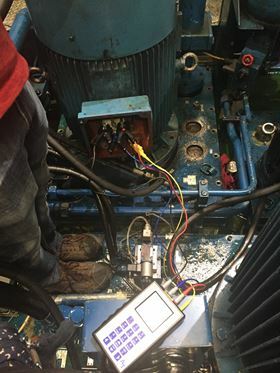 All-Test Pro's At5 and the AT33 IND utilize MCA (Motor Circuit Analysis) testing and can evaluate motors for connection faults, stator faults (turn-to-turn and coil-to-coil), ground faults, and rotor faults all with one instrument.